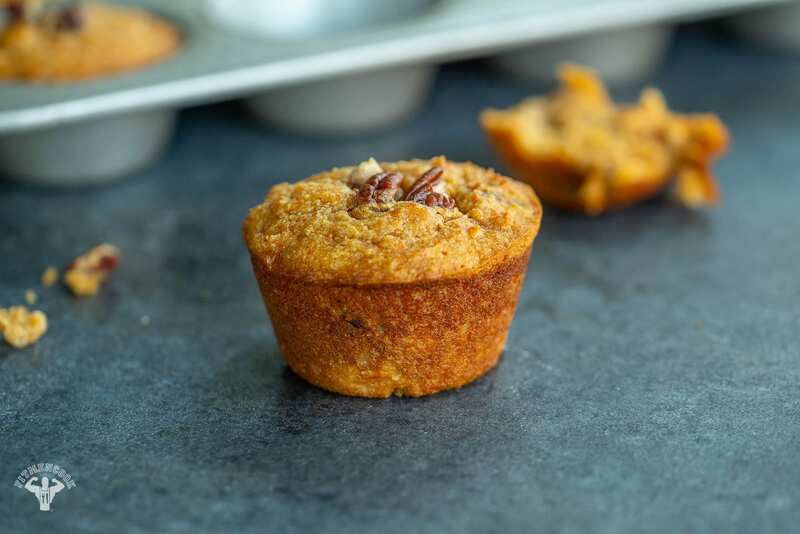 It’s no secret that sweet potato muffins are one of my favorite foods. Growing up in the south (Texas), I’ve had my fair share of it and in many different forms. While it’s good year-round, during the fall it kinda takes on a new meaning for me. With the colder weather (and the crockpot or Instant Pot creating warming recipes), sweet potato in the fall reminds me of comfort food. So, I try to sneak it into my diet whenever I can, especially during this time of year, because it reminds me of my mom’s home-cooking. To that end, I made this simple gluten-free sweet potato muffin recipe. It’s pretty minimal and carefully incorporates the typical flavors of the south – cinnamon, maple, and sweet potato. It’s so good, I WOULD even recommend this dish at the Thanksgiving table which, as you may or may not know, is pretty much the Superbowl of cooking where I’m from! But this calorie-conscious makeover can absolutely stand on its own… Bet. Poke a few holes in 2 small, raw sweet potatoes and place them on a baking sheet. Bake in the oven for about 45 minutes or until soft. Once baked, allow them to cool, then chop off the ends and remove the skin. Set aside. In a bowl, mix together the wet ingredients. In a larger separate bowl, mix together the dry ingredients. Add the wet ingredients to the dry ingredients and mix together using a spatula. Fold in the cooled, baked sweet potato and, if desired, chopped pecans. Lightly spray a muffin pan with nonstick baking spray or olive oil. Evenly divide the batter. Bake in the oven for 20 minutes, or until the top is golden brown and you can easily pierce it with a toothpick and it comes out clean. Allow them to cool for a few minutes in the tray, then remove them from the molds. Enjoy!